We hope this article helped you create a custom page for blog posts in WordPress. For feedback and questions please leave us a comment or reach us on twitter @WPBeginner. I did everything stated in the instructions to set up a blog page, with a static web home page and I am getting a page showing parent. I have been trying to figure this out and have hit a brick wall. Can I create a static home page and multiple post blogs. For example: I have various menu items, and would like to place my blogs on each of the sub menu items. Just to keep separate topics. I have managed to create a blog page with the posts displaying. However, I don’t want to re-create my home page as it already has content on it. The posts are still showing at the bottom of my existing home page.. if that makes sense! Your specific theme may display the posts there by default, if you reach out to your specific theme’s support they can let you know if that is a built-in option you can change. Hey! I really need help with creating my own “I NEED HELP WITH…” section that you have on your site on your sidebar. Hope you will be able to assist. Thank you so much!! What could be the reason for my website not loading videos or images on static front page? Could it be the theme I use? I have done all the steps above and uploaded a picture in the contect of my home page, but it only shows the text (not even borders or any place where the picture should appear). When I make the same page to appear as a standard page (not front one) and to be reached through the menu, it loads perfectly together with the image. Same happens when I try it with embeded video. to see if you can find the likely culprit for the error. I am trying to create a separate page which I can communicate to prospective subscribers to subscribe. Unable to do that. Tried to use mailchimp but the code it generates does not work after I create a new page. Hi Is it possible to display posts BOTH on the homepage and on another blog page (in the same manner)? I tried copy-pasting PHP code, but that doesn’t seem to work. Its good for me that my posts on Serbian language show up on home page, but i need page to publish my posts on English, do we have solution for that? Is it possible to have your home page be a grid layout and your blog page be all your posts one after the other? I am looking for a “landing” page to be in grid format and I have the Content Views plugin and the shortcode for it. I am just looking for where to put that shortcode. Thanks. It is possible, you would set a specific page as your blog page and the page you set as your home page would be where you place the code for the grid. Great post. I was looking for this. Thanks a lot. But can you please let me know how to have blog posts on my home page and a specific blog page also? But how do you create a blog page WITHOUT making your home page static? In that scenario, your home page would be your blog page. You could add your categories in your menu to have the categories list the posts on the generated pages in that scenario. This helped me a lot with my confusion. Thank you. Hi, can you please tell me why my blog posts go to the main page, and that main page is not shown as a page in the WP control panel? I mean my posts are posted on the homepage. But when I go to the pages tab, my posts are not shown, and nothing is shown as home page. After this article I know I can create a new page called homepage and direct all my posts there, but I’m curious as to why the above thing happens. Also, is there any harm to the site if I don’t use that default homepage scene altogether? WordPress will by default create a home page based on your theme’s styling that you cannot directly edit which lists your newest posts. You can create a new page for your home page and set that page under Settings > Reading without any issue. If you wanted to list posts on other pages, you would normally add a link to the specific category to your menu for WordPress to generate the page for you or manually add the links to your posts. Thank you very much. I am not a techie, and setting up my site has been very difficult for me, but I am finding that with patience I can get there! I like the way that you had both the video and written explanations here. This article is great !Thank you for sharing! I do have an opposite situation. I want to move several blog posts from the Blog page to a page called articles. What is the best way to do it? Hello! I have the opposite issue….I do not want a static home page, but when I change my homepage settings as “Your Latest Posts” my blog page is empty when one clicks on “Blog” in the Menus. I had it working but must have tweaked something and lost it. When you set the home page to show your posts, your home page becomes your blog page. You could add categories to your menu to list posts in that specific category similar to the blog page. I want to show my appreciation to you just for rescuing me from this trouble. Just after surfing throughout the world wide web and seeing methods that were not helpful, I assumed my entire life was gone. Existing without the strategies to the difficulties you have resolved all through your good guide is a serious case, and ones which may have in a negative way affected my entire career if I hadn’t encountered your blog post. The natural talent and kindness in dealing with every part was vital. I don’t know what I would have done if I had not come upon such a subject like this. I’m able to at this point look forward to my future. Thanks so much for your impressive and result oriented help. I won’t think twice to propose your blog post to anybody who needs and wants guidance on this problem. The video is great. But I have more question: Can I show posts on different pages? What’s the post category do? Can I show different category of posts on different pages? I have the same question as Gavin. I’d like to have one page for blog posts and another for podcast show notes. I have the individual posts categorized differently, but I’m not sure how to create different pages to display them. This stumped me for longer than I’m proud to admit. Your video solved my problem in seconds. I’m using the Divi theme (and a child theme of it);everything is updated as of this posting. I used one of the Divi layouts for a separate blog page. All is well until I choose the “Older Posts” or if I turn on pagination, another page #. The blog page that I made does refresh like it’s going to pull in posts, but then the sidebar which had been on the right appears on the left, and a big empty 2/3 column space with NO posts in it. Love your emails I receive for help with WP! Seems like the template you applied is only used for the blog page and not for blog archive pages. When you click on the next page then it switches to show the template set for your archive pages. Please reach out to Divi support and they will be able to help you find a workaround. Who knew you needed two different pages? Or layouts, or whatever….I have been having non-stop problems with setting up a blog page, and you’d think that’d be the foremost easiest thing to do for WordPress! Argh! I have a question. I have followed the video instructions which were great! However, I cant figure out how to fix one glitch. The feature image that i had for my blog page (static page called ‘Stories’) has been replaced by the homepage feature image once i chose the Stories page as the blog page. My homepage is static. I don’t want the same page for my blog page as i have at the homepage. If you could give me some instruction that would be great! Thanks! Hi, How to add only blog category posts on blog page? I have 3 categories on my site like Blog, reviews and coupons. but i want to show only blog category posts on my blog page, how would i do that? right now all category post are showing up on my blog page reviews and coupons too. How would i make only one category to be showed on blog page? there are twp options for homepage in WordPress 1.latest posts 2. custom page. should I choose latest post option or custom page option in WordPress as my homepage. I only have blog posts to show and i want to show all of them on my homepage. so Whichone of these will increase seo and PR of my homepage latest posts option or custom page. FIRST: Your tutorial has been very usefull and illuminating! So… I have a one page site, I want to add some preview posts to the landing page, and make another page where all the posts are… BUT I have one big problem: the menu in my blog page doesn´t work, cause my main page works on css #… I haven’t figure out how to even explain this since I haven’t found a solution in the internet, can you please help me? It seems like your site is setup to be a single page site. For your blog page link, you will need to edit the navigation menu and manually add the blog page link there. Hi, thanks for the post. Would you no-index the blog page? No. Adding no-index to the blog page will prevent search engines from indexing it. i have my blog page and in blog page in right sidebar there is search box. but i search any content in searchbar, it’s redirect the main url to example.com/?s=seo. but i want it to example.com/blog/?s=seo. what should i do? Hi, thanks for a great video. I have created the blog post page and all the posts show. However they show in full and not summary even though summary is checked in the reading section. Please help! 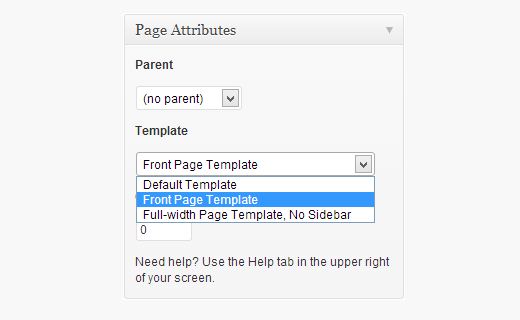 Please see if your theme settings has an option to display excerpts on the blog page. Thank you so much for the video!! This explained everything, step by step and my site has now been re-designed. Thank for the video, really helpful. However, I’ve still got a problem here. I’ve created my Blog page with a certain text on it. Like: “I’m glad to share my knowledge with you!”, and then I plan for the posts to follow. But when I’ve tuned the Blog page to become a default page for posts as per this video guide, it doesn’t display that text anymore. if I use a page for my blog post doesn’t it not allow me to use tags and categories because it is creating Pages as blog posts? The page will just act as a placeholder to display your blog posts. You will write your blog posts as you normally do without editing that page.